Orange peel pickle, are you serious? Na, I am not kidding! After having thrown tons of orange peel all my life, I have come up with a tasty, tangy way to relish this vitamin C rich orange cover. Thus far, I was only aware of one use of orange peel, that is, face powder. Yes, during childhood, we would dry these peels under direct sunlight and then grind them to powder for application on face as a rejuvenating face pack. I do not remember whether the face pack ever did any trick, I simply loved the aroma! Another favorite activity we would indulge in during childhood was to squeeze orange peels in each other's eyes - yes, that was such an exciting moment. I do this even now...LOL!, though I do it with myself. For a long time, I have been discarding orange covers like anything or only using them as a deodorizer in my shoe rack and refrigerator. 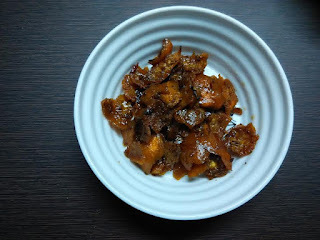 I imagined doing something else with these Vitamin C rich peels, which have umpteen other health benefits, including their use in cancer medicine, and have come up with this tangy pickle. Now let's come back to the recipe. I have recently started using lemon peels for pickle. Earlier, I would throw them after squeezing juice out of lemons. But not any longer! You can make sweet 'n sour pickle with lemon peels. 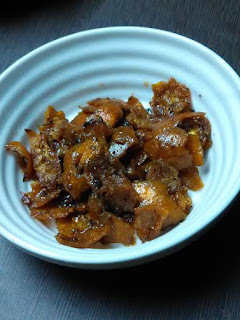 Here's the recipe to make lemon peel pickle. This was something that intrigued my mind when I was throwing orange peels a couple of days back. So I thought of doing an experiment. I checked online whether anyone has tried this. I came across one recipe that attracted my attention. I have modified the recipe and come up with this lip-smacking delight. Not only this, these orange covers are rich in non-soluble polysaccharides, which are a form of dietary fibere. These include tannins, pectin, and hemi-cellulose - all of which keep the digestive tract in good health and ensure proper bowel movement. These compounds help prevent constipation. I have come across some studies that even link orange peels to heart health and cancer prevention. Still need to do more research to come up with conclusive evidence in this regard. Since this was my experiment, I used peels of only one orange. Boil orange peels for 5 minutes. This will ensure that the peels are clear of any dirt, dust, or pesticides. This will also make them softer so that you can chop them easily. Let them dry for 1-2 hours. Take roasted sesame seeds, jeera, red chilly powder, and hing. Grind these ingredients using pestle and mortar. Now take oil in a pan. Add the spice powder. Throw in ajwain. Throw in finely chopped orange peels. Let the spices coat the peels. Now take grated gur. Melt it in a pan on low flame. Immediately turn off the flame and add vinegar to it. Mix very well. Add black salt in it. 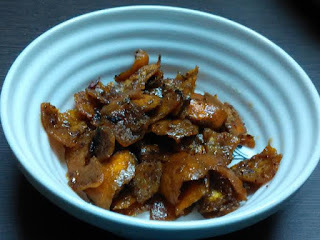 Pour this vinegar-gur mixture over the spiced orange peels. Keep it in sun for 2-3 days. Your tasty, tangy orange peel pickle is ready. I still can't believe I have come up with this recipe.